I've really been bitten by the "Oh shiny!!!" bug lately. It sort of explains the lack of progress on a couple of my build threads. 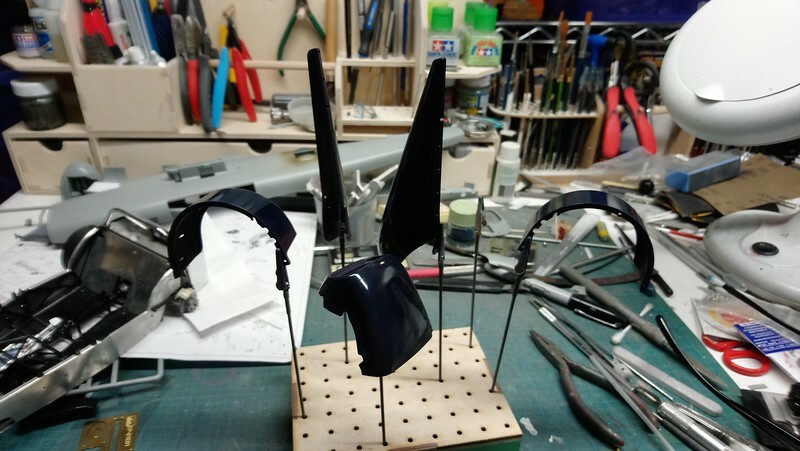 Between the F-4E, B-25 and Spitfire XIX ive got stated on here, I've pulled out of the stash and worked on a Zoids kit, a Fly Hurricane and now this. 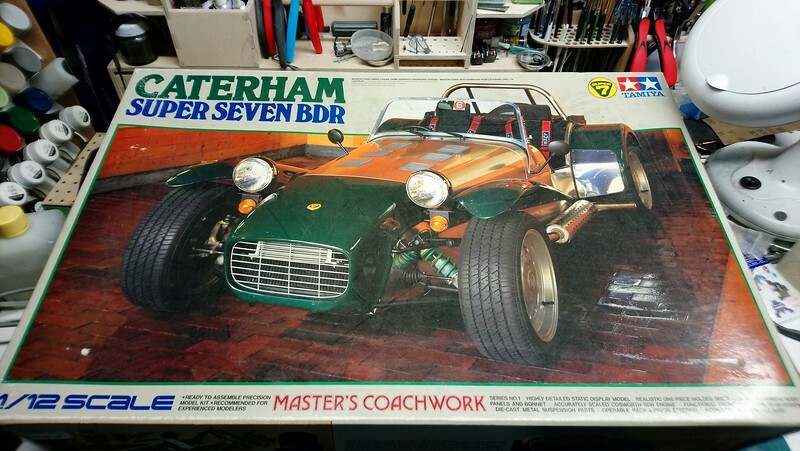 This is the original release of the Tamiya Caterham kit from 1994. 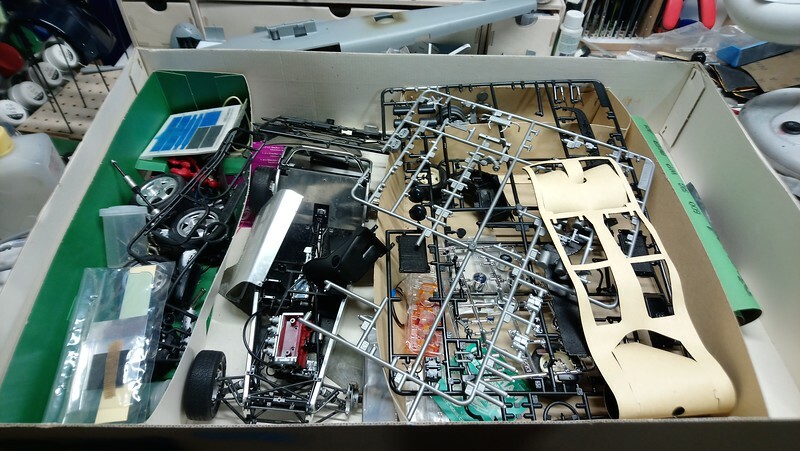 At the time, it was supposedly the most expensive kit ever produced by Tamiya. I picked up my copy shortly after it came out and made a right mess of it. 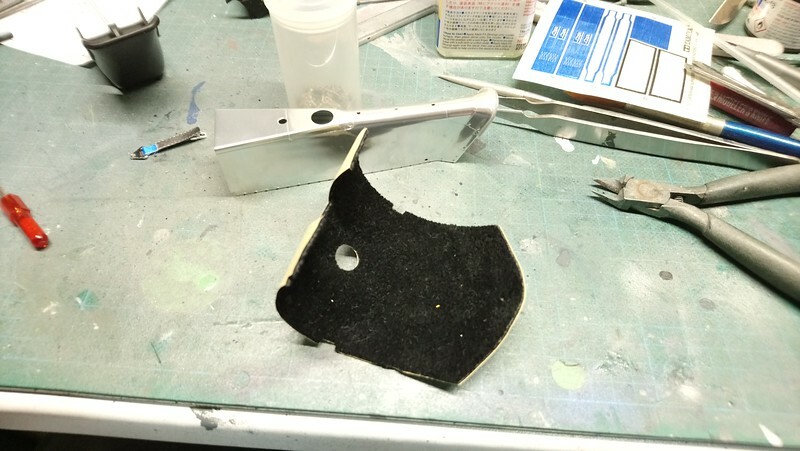 I tried to polish the aluminum body panels and only made it worse. I tried to cover the seats in leather and made them worse. So it went back into the box and has traveled with me for over 20 years. 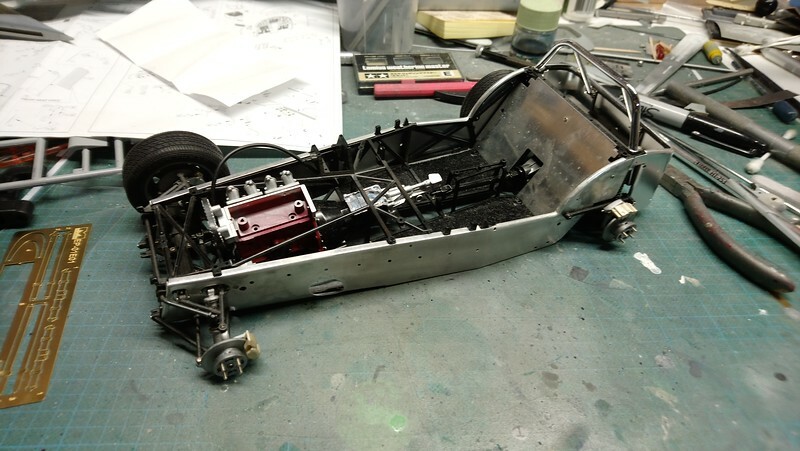 Earlier this year, Tamiya reissued the kit. I've naturally picked up a new copy to have another go at it. But I first decided to see if I could resurrect this one. To do so, I managed to secure new seats. The one panel that's really tarnished I'll just leave as there's not much else I can do. Here's what the inside of the box looked like after all this time. I used a mix of Gunze purple and metallic black. 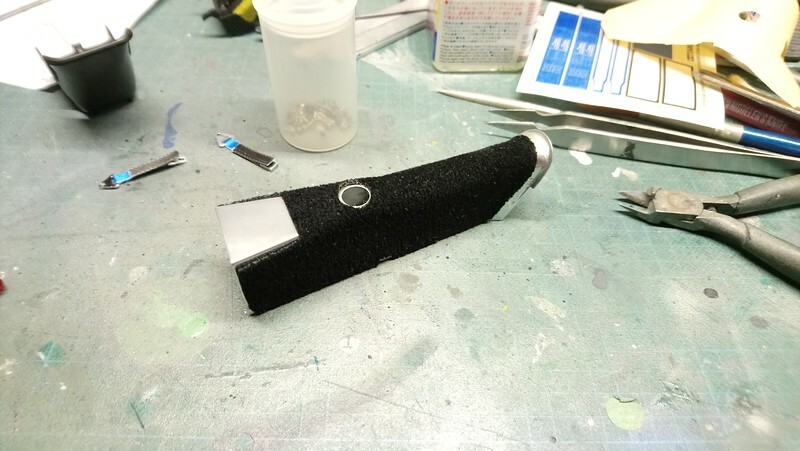 The original paint had etched the plastic badly so it took a bit of sanding to get things smooth. 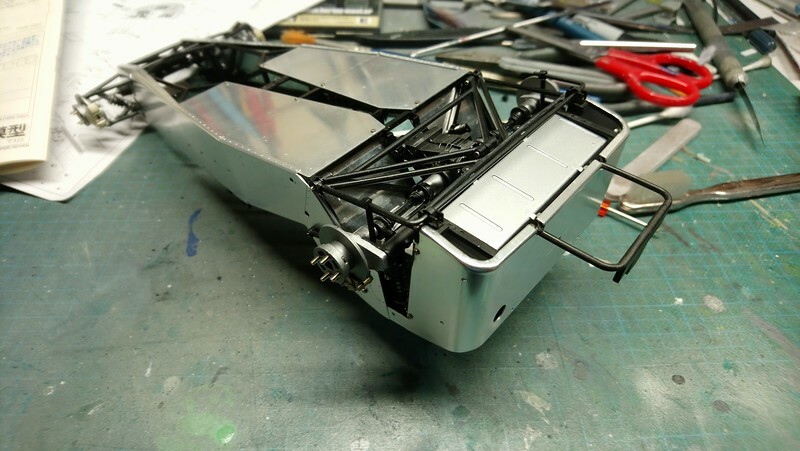 Here's the chassis as found. The engines wasn't screwed in so that came out. The wheels and tires were unbolted and then I started working on it. 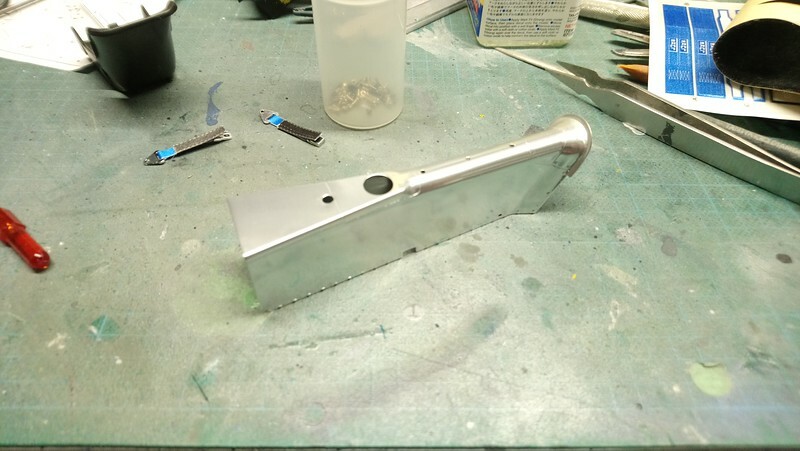 The frame needed all the mould parting lines cleaned up, even some sprue attachment points too. 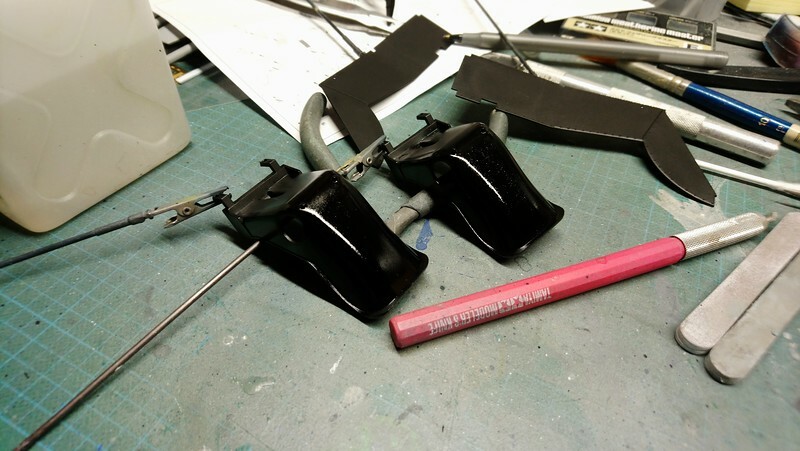 I then painted them in semigloss black. The results are much better already. 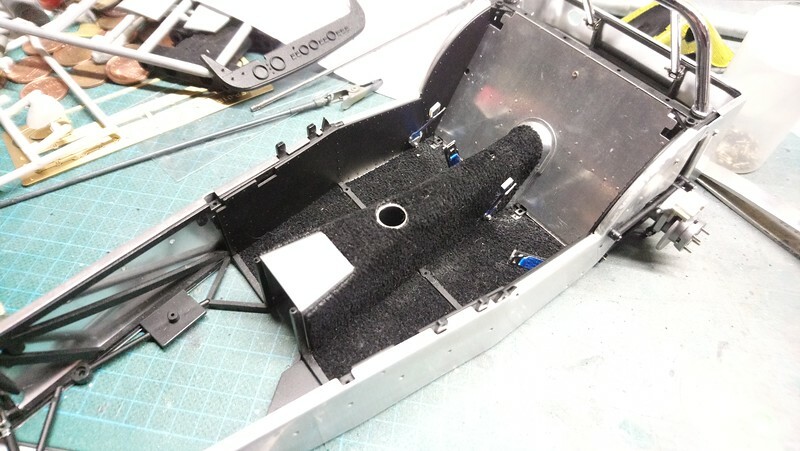 I finished installing the rear suspension as it was only half completed. Onto the seats. The ones I picked up aren't an exact match for the original ones. They are the lightweight carbon/Kevlar ones from the JPE version but were all I could find. 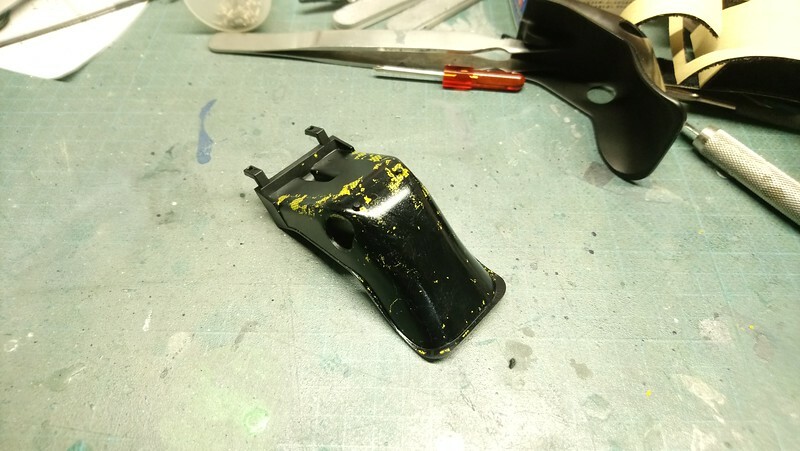 I painted them semigloss black on the front and gloss black on the back in preparation for using some carbon/Kevlar decals. 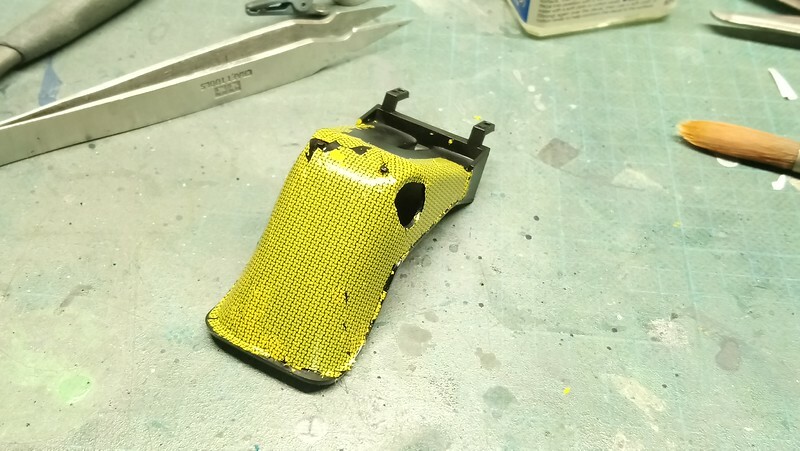 The Scale Motorsports decals I used went on well, conformed nicely and then shattered into a right mess. This was after I tried to patch some of the holes but it only got worse from there. I stripped the decals off and went with some Hasegawa adhesive film I have. It's a bit pricey but works really well. Prior to installing the seats, the center tunnel had to go in. This is stamped aluminum but it gets covered in carpet. With the seats center tunnel and then the seats in place. Next up is the engine. Great recovery Carl! I'm not into scale car models in general, but this kit has always intrigued me. Your build is really adding to its appeal! Just stopping by for a look Carl. Man, I just love this car. Always loved the British sport cars. Is this an indigenous British car? The roadsters are so much fun. I had two Triumph TR-6's back in the day. Sold them off. Purchased a BMW M3 rocket and drove it every day for ten years. Sold it. Porsche Carrera 4S, sold it. Now I'm bi-pedal here in Singapore and dreaming of the day I can drive again. Love what you're doing to the Chaterham super seven. Looks awesome and super clean. Thanks for sharing this with us Carl. I bought the original kit in 1994 too! And due to unforeseen circumstances, it's still in the box! A couple of months after I bought it in my local model shop, my world ground to a halt as my first marriage went rapidly down the pan, leaving me dazed and totally bewildered. Wasn't a good time, as anyone who's been through it will know. Picked myself up, dusted myself down and started again. Let's see, another marriage, make some masters for resin armour, write some model articles for Military Modelling, another divorce. Worked a lot, had a heart attack, STILL didn't get back to the Caterham. So now I'm retired, living on my own (got a lady in tow), my local model shop has gone, I make models all day (and night sometimes!) and the Caterham has been reissued at what I can only say is silly money. Might just be time to drag the box out, open the lid and have a go! In the meantime, have fun with yours! Thanks Tom! I kept it around thinking one day I'd find replacement parts and I'm glad I did. I've got a couple more 1/12 cars in the stash. 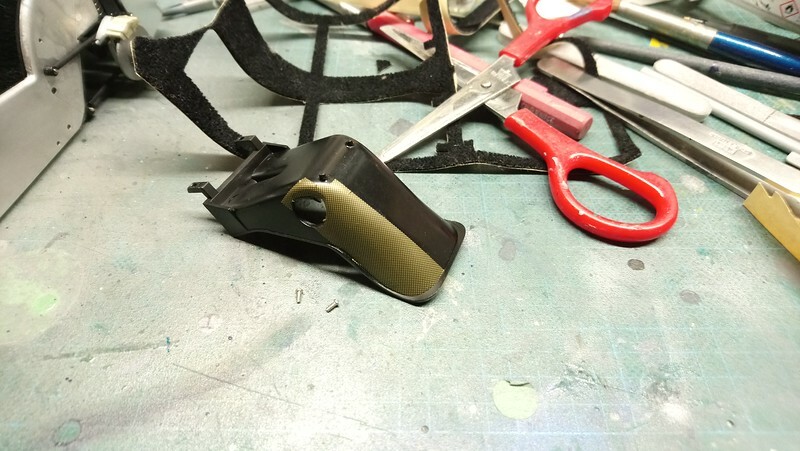 They're the equivalent of our 1/32 planes to the smaller scales. There's so much more detail in them. Thanks Troy! 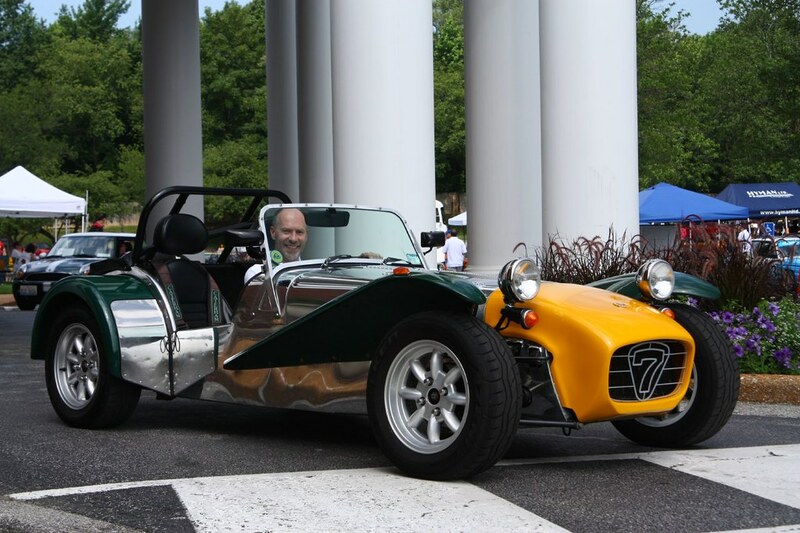 The Caterham was originally created by Colin Chapman and was sold as a Lotus Seven until the early '70s. 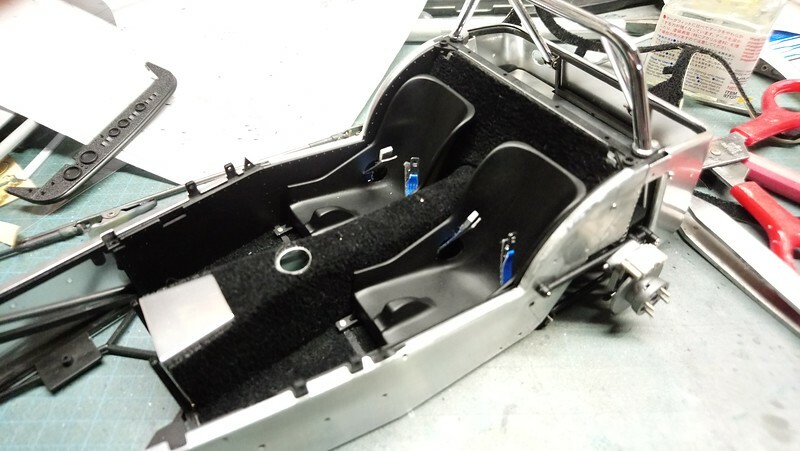 He got tired of making them so one of their dealers Caterham bought the rights and tooling for the car and have been making it ever since. I got to sit in one years ago and loved how simple the car is. Not to mention low. The curb weight is around 1200 lbs and they had one version that was under 1000. Newer ones use the Ford Duratec out of the Focus so they're fairly easy to service. Thanks Bruce! It almost sounds like it's your Rosebud from Citizen Kane. Hopefully you'll get around around to building it. Speaking of which, supposedly Mr Tamiya owned a Seven which is why they made the kit. The pricing on the reissue is all over the map. I managed to pick one up for the same price as my original issue- $399 CAD. I was really surprised by this but took advantage of it. Great Hobbies here still has it listed for that price but it's on back order now. Get one if you can Shawn. It's almost like putting the real thing together since they were sold as kit cars. Gotta love it and I am impressed. Awesome recovery and looking so good. Having driven a Seven on a driving day a couple of years ago, all I can say is unbelievably scary if you floor it.